The Denver tungsten carbide wedding band is full of style and charm that is guaranteed to turn heads. 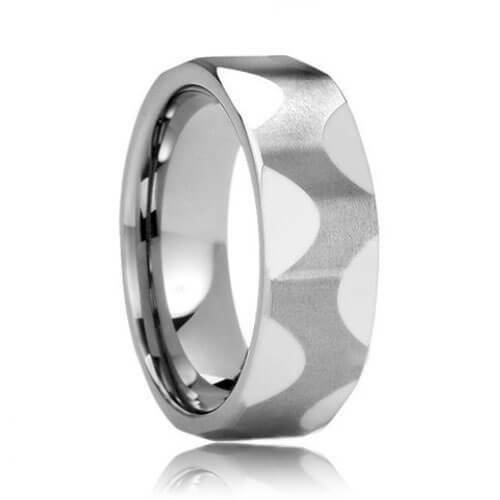 Sleek and twisting lines make this style of tungsten rings a must have. The oscillating contours feature a matte finish in a smooth and uniform motion from one side of the tungsten carbide ring to the other side. The highly polished recessed areas form a perfect contrast to the matte finish pattern. Most sizes ship within 2 - 3 business days. Free Lifetime Warranty and Lifetime Sizing; pay no restocking fees or deductibles! The only thing I knew about tungsten carbide before buying my tungsten wedding ring is that it was really hard. I did a lot of research over the internet and after a few days, I stumbled upon this website. I had some trouble because I am from the UK and didn't know my US ring size. Well, Tungsten Rings & co was amazing and after an email, they converted my ring size to US for me. Once it arrived, it was worth the wait. The ring is brilliant! I showed it to all of my friends and they all absolutely loved it. Thanks Tungsten Rings & co, you made a happy customer.